Anyone that’s ever had to make a last minute reservation at a restaurant would have surely come across Quandoo. Utilising the best in cutting-edge technology, the platform’s array of interactive features makes reservation processes convenient and seamless, and its global network of over 17,000 restaurants means that you literally have a world of choices at your fingertips. As the colossal restaurant reservation platform celebrates its fourth anniversary in Singapore, the brand—to show its appreciation—will unveil a host of great-value pre-paid smart offers, in partnership with 11 selected restaurants. Whether it’s local favourites, fine dining establishments or even places where you and your buddies can indulge in karaoke and board games, there’s bound to be something for you. These smart offers will be available from now until 20 December 2018 and for selected restaurants, all the way until 31 December 2018. To enjoy these specially curated dining experiences, users can pre-pay and book via their website. Calling all gourmands and foodies alike, this is one limited-time-only offer not to be missed. 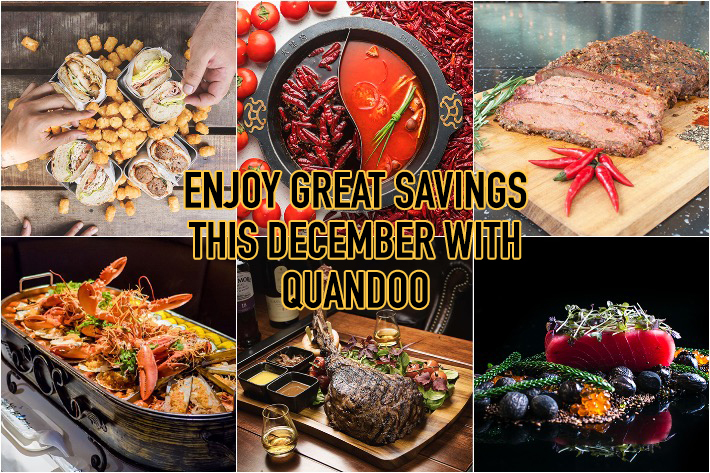 Here are 11 restaurants where you can enjoy great savings through Quandoo’s smart offers. For the love of all things deep-fried, greasy and perfect for any occasion, fried chicken is a quintessential comfort food that everybody loves. And where better to indulge our favourite guilty pleasure than at KFC? They’ve impressed us (and successfully contributed to our waistlines) over the years with their various seasonal offerings, but this new entrant may prove to be even more unforgiving—in a good way, of course. Set to tantalise the taste buds on all fronts, the all-new Dip, Dunk ’N Share Bucket comprises 6 pieces of KFC’s signature Hot & Crispy Tenders, 12 Nuggets, 1 medium fries and a pair of 2 sauces—Sour Cream & Onion and BBQ—as well as a brand-new addition Spicy BBQ Pops. Providing a medley of flavour and textural elements from tang to heat and even a robust barbecue flavour, all nicely underscored by the added crunch from the Spicy BBQ Pops, this is one solid holiday bundle that has it all. If there was ever a good enough reason for you to put your dieting plans on hold for chocolate, Christmas would definitely come up tops. A season where eating and indulging in decadent treats is a vital part, this is the time where it’s totally fine to go full beast mode on all things rich and luxurious. And where better to stock up on quality chocolates than at ROYCE’? One of the top chocolatiers in Japan and our personal favourite, ROYCE’ really goes above and beyond your standard truffles and chocolate bars. Established in 1983 in Hokkaido, Japan, ROYCE’ chocolates have gained itself international recognition for their original, superior quality confectioneries. Bringing together the best ingredients from all over the world, together with the rich and creamy dairy products from Hokkaido, ROYCE’ never fails to impress with their offerings old and new. This season of giving, what better way to put a smile on the faces of your loved ones than to gift them with an assortment of decadent treats from ROYCE’? Newly revamped with a brand new look, their ION Orchard outlet promises a better customer experience, in addition to boasting a wider array of the brand’s signature products. Feeling lucky? Be sure to snag yourself a complimentary gift during their in-store promotion from 10 to 25 December 2018, where, for every S$100 spend, you get to participate in a lucky dip, winning you a special Christmas gift courtesy of ROYCE’. Nayuki has finally reached our sunny shores and we bet you are as excited as we are! 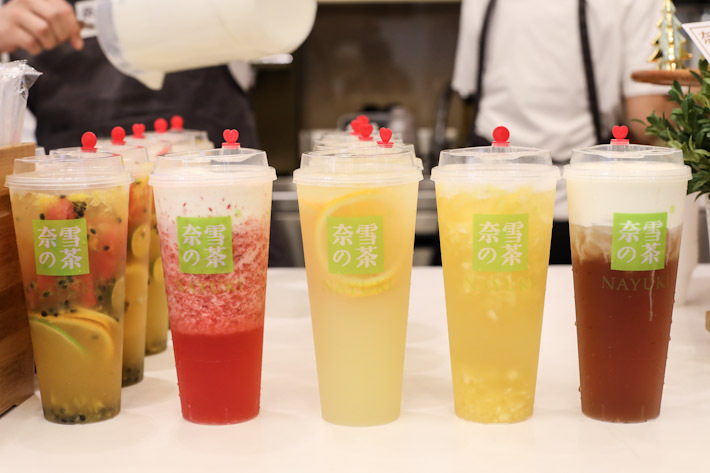 Priding themselves on serving high-quality brews alongside whacky soft Euro breads, Nayuki isn’t just another typical cheese tea store that is hopping onto the bandwagon of food fads. An extremely popular brand in China that has already been around for more than three years, Nayuki is said to pioneer the concept of pairing Euro-inspired bakes with fresh fruit blend premium teas. Their success has led them to open dozens of outlets across mainland China. Since its beginning in 2015, this Shenzhen-born brand has opened an over 180 stores, earning themselves the reputation of “The Nayuki Veloci-tea” due to their rapid expansion. 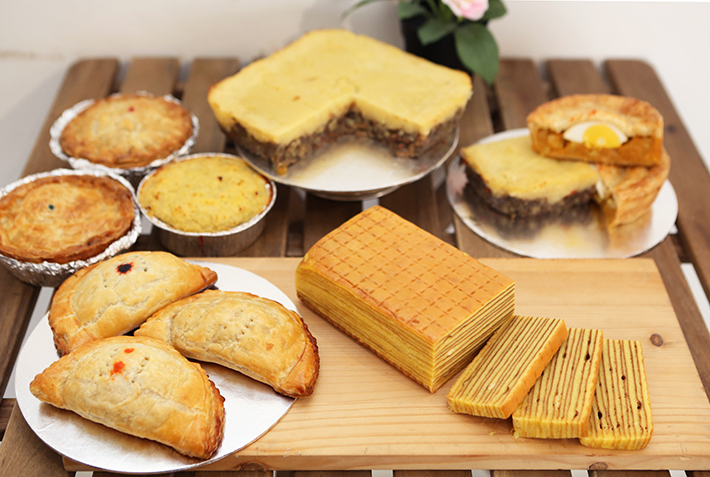 A joint venture between Shenzhen Pindao and BreadTalk Group, this is Nayuki’s very first outlet outside of China. And it is right here in Singapore! Nayuki is set to open at Vivocity tomorrow, 8th December 2018. 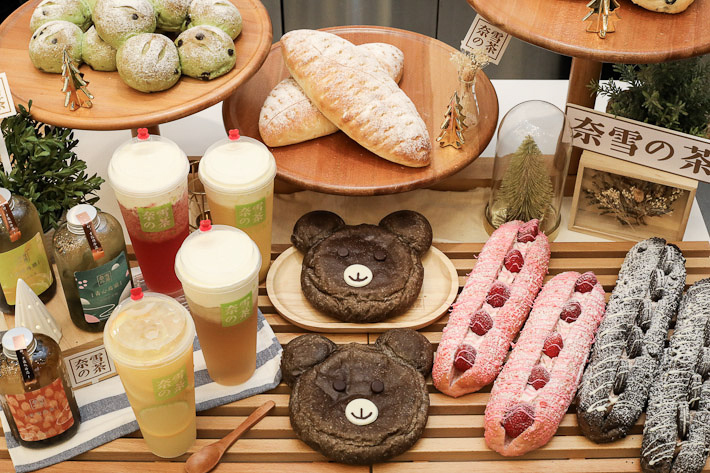 You’d also be glad to hear that as part of their opening, Nayuki will be giving away one free bread with every purchase of a drink (while stocks last! ).